If you post your photos in the internet or email them to others, these images are at the risk of being copied without your permission. One deterrent to scare people away from stealing your shots is to place a watermark on your image. It can also provide information that would benefit the people you want to share your image with. Generic text – this kind of watermark does not give any detailed information about you. For example, it can simply say ‘Do not copy’ or ‘Sample’. Specific text – your watermark can also be used to identify you or the photograph in some way, such as your name or your website name. Image – instead of text, an icon or logo may be used as a watermark for your image. This looks a bit more complex than a simple text but you just need to make the image watermark once and then apply it to all your photos. It is a great watermark if you have a business logo. Copyright © – this is very often used because it tells everyone that you have placed copyright protection over the image. Although some will try to get a way around it by cropping out the watermark, or by removing it with a photo editing program, it does raise a red flag that you’re on the lookout to make sure your images are not stolen. Embedded – this type of watermark is found in the image file data, rather than being displayed on the image itself. The advantage of this is that there is no visible watermark that may detract the viewer from fully appreciating the shot. However, embedded watermarking is not free and you would need to purchase a software or program if you prefer to use that method. Many photographers do not like to add a visible watermark to their image because it covers a portion of the shot, even if it is transparent, and it can disrupt the concentration of the viewer. However, having a watermark is good practice especially if you are into online commercial photography. If you would notice, all photo stock sites have their or the photographer’s watermark shown very obviously and covering most of the frame in the images that have been uploaded to the site. These images are often in full resolution and what the customer would get once the watermark is removed. By stamping the image with a huge and blatant watermark, it will be difficult for an online thief to get rid off it. If you simply want to share your photos online without the intent to sell them, you can upload a low resolution copy with a watermark at the bottom corner. Low res images can still look great online but will be small in size if they were printed. Also, it will be harder for an online thief to just crop out the watermark at the edge of the shot because they might also crop out an important element in the image. Watermarking an image is a matter of personal preference and is not a fool-proof method to protect your images but it will certainly make others think twice before attempting to download and use your image without your consent. There are many ways to add a watermark, from adding it through photo editing, to purchasing watermarking software that can watermark batches of photos all at once. 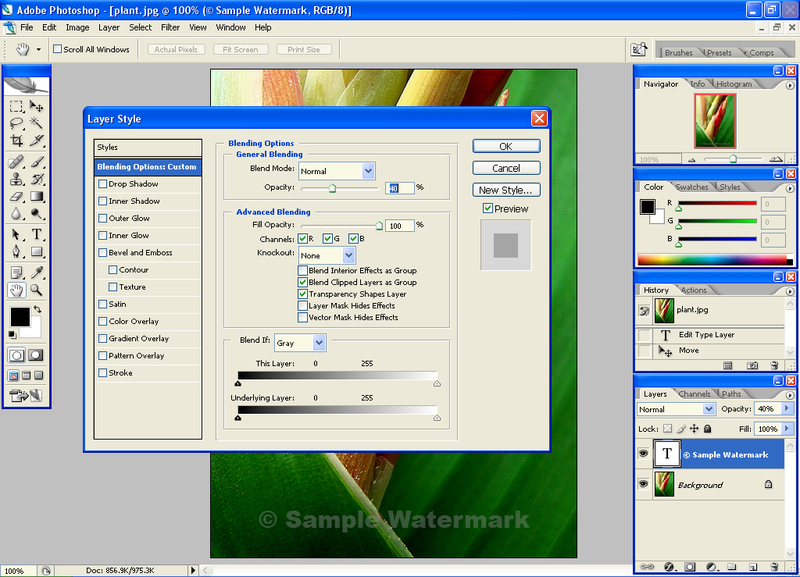 In this article, we will be using Adobe Photoshop CS2 to add a text watermark to an image. Keep the original images. Store them in a secure folder so there is no chance they will accidentally be saved over once your start photo editing. Make copies for watermarking. Save them in a separate folder so they will be easy to find and access. Decide whether you want to watermark your images as a batch or one at a time. If you have loads of photos, it would be more convenient to batch watermark them. However, you will not have complete control over the watermark’s exact placement compared to if you were doing them individually. Decide on what your watermark will look like. Experiment with its size, opacity, and its location in the image. The more obvious and bigger the watermark, the better it is for security reasons. But the downside is it could cover much of the shot and also spoil the impact of the image. Try to find a balance by making the watermark visible but not intrusive. Adding a watermark in Photoshop is quick and easy and it won’t take up much of your time at all. 1. Open your image, make a copy layer and then click on the Type tool. Type in your copyright symbol © (keyboard shortcut is Alt + 0169 if you’re using Windows and Option-G if you’re using Mac) and your desired text. 2. While still using the Type tool, you can highlight the entire text and choose the desired color, font and size. 3. The text will appear as a solid color so if you want to make it blend more with the image, it has to look less opaque. Click on Layer > Layer Style > Blending Options and drag the slider of the opacity bar to make the text more transparent (see screenshot). 4. Once you’re satisfied with its opacity, click on the Move tool and drag the watermark to the desired spot in your image. 5. Save the watermarked copy image. This entry was posted on Saturday, January 22nd, 2011 at 10:46 am	and is filed under Articles, Beginner Tutorials, Business of Photography, Miscellaneous, Photography Tutorials, Photoshop Tutorials. You can follow any responses to this entry through the RSS 2.0 feed. You can leave a response, or trackback from your own site.